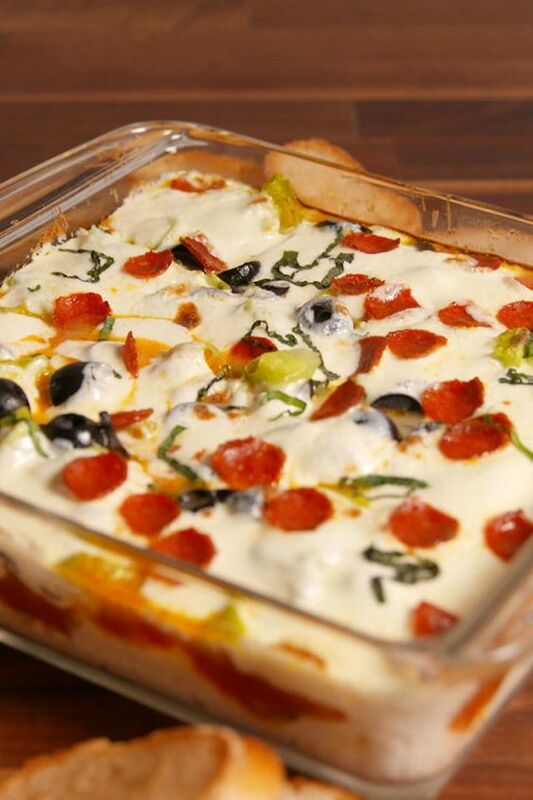 You'll be the life of the party with this easy pizza seven layer dip recipe from Delish.com. Preheat broiler to medium. Grease a 9-x-9” dish baking dish with cooking spray. Spread ricotta into an even layer on the bottom of the baking dish. Sprinkle parsley over the ricotta, then spread a thin layer of marinara over the herbs. Top with single layers each of Parmesan, pepperoncini, black olives, mozzarella and pepperoni. Broil until the cheese has melted. Garnish with basil and serve warm with the baguette slices.